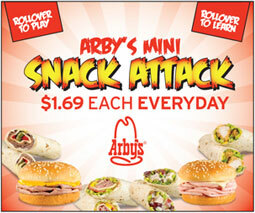 Arby's is marketing some new mini sandwiches and wraps as Mini Snacks. Arby's is using an online advertising on sites like Yahoo! to promote the mini snacks. The 'Snack Attack' ads are actually games where players grab as many Mini Snack sandwiches as quick as they can. Players can also select Mini Snack items to see their ingredients. An example of a new Mini Snack item is the Italian Mini Wrap which has ham, salami and pepperoni combined with banana peppers, lettuce, swiss cheese and mayonnaise in a flour tortilla. It and the other Snack Attack items cost $1.69. was the place to go." Other major fast food players like BK, McDonald's and Pizza Hut are already using online marketing to promote new products, but they also usually advertise the new items with TV ads, too. This Arby's marketing effort is limited to the web. This is a marketing test for Arby's limited to Savannah, GA and Montgomery, AL, where Arby's has many company owned stores. I'm not buying any "mini" fast food for a buck sixty-nine.